Hancock County Sheriff Scott Bentzinger has a new addition to his list of deputies. Sheriff Bentzinger has added a full service K-9 that is trained in drug detection, tracking and apprehension. 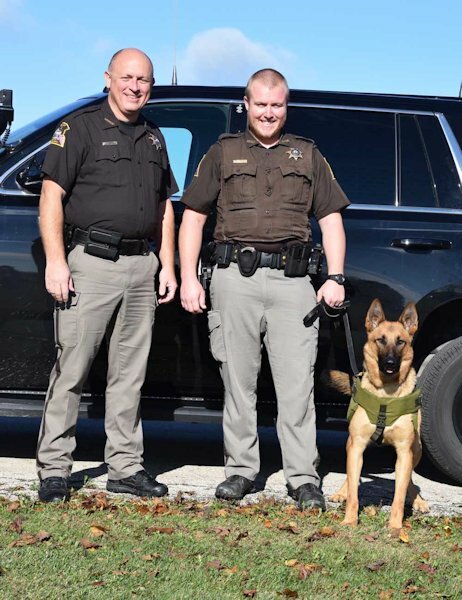 The K-9 (Zaire) and his handler, Deputy Brock Landis, completed a 10 week training program at the Illinois State Police academy and graduated on November 6th, 2015. Assisting the Sheriff's K-9 program with food and veterinary services are the Carthage Veterinary Service and the Hancock Veterinary Clinic in Hamilton. A bullet resistant vest for the K-9 has been donated by TREAD Armament and Weaponry and Vesting America's Police K-9's.